Courtesy of Bridgetown Inc., Photo by Eric DePangher, SightGlass Photography. 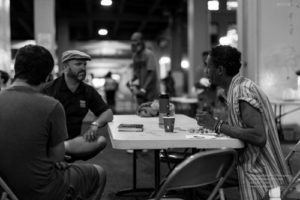 Every Thursday night, rain or shine, willing volunteers and homeless alike gather under the Burnside Bridge for Night Strike, an evening of care and companionship. Concordia University (CU) students, faculty and staff work with local nonprofit Because People Matter Inc. to provide relief, mobilization and transformation. 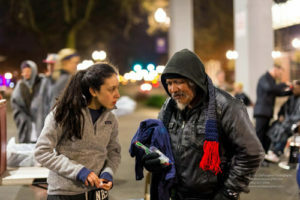 This service opportunity, Night Strike, was born both from the university’s Christian mission and the need and necessity to love and care for those impacted by food and housing insecurity in the Portland area, according to Scott Ferguson, associate dean of student engagement & student affairs. Night Strike is not only an opportunity for any member of the homeless community to enjoy a hot meal, receive a free haircut, replace clothing and enjoy company. It is an ideal occasion for volunteers to join in relationship with some incredibly resilient individuals, he added. The university sends 200 volunteers each semester to experience this evening mission. One of them, Cecilia Magistrale, Concordia student and Night Strike coordinator, explained, “Night Strike develops relationships, and offers a unique experience for volunteers to break free of biases by stepping out of one’s comfort zone.” She also helps lead CU’s Hunger & Homelessness Awareness Week events Nov. 11-19. For details on that event, visit HHWeek.org. 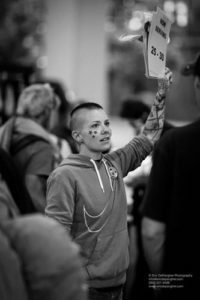 For more information on Night Strike, visit bpmpdx.org. Logan is a Portland native and a junior at Concordia University studying psychology and fine art.